Somehow Robin Talley has completely passed me by, though considering I don't read much YA nowadays I suppose I shouldn't be too surprised. It's not even that I don't read YA out of choice, I've just been drawn to a lot more adult fiction this year. 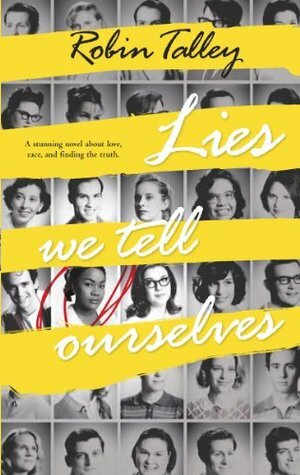 I wanted to check out some of Robin's work after I discovered As I Descended, which is one of my most anticipated releases of 2016, and then I stumbled across her debut novel, Lies We Tell Ourselves, and just had to read it. I haven't read many books set during the '50s - if any - so it was refreshing to read about a time period I don't stray into that often; I love historical fiction, but I'm drawn to earlier history much more than modern history, mainly because of my lifelong love of the Tudors. I also very rarely read books in which racial issues are such a focal point; again, this is not something I do out of choice, but something that just kind of... happens. The only books I can pluck from the top of my head that deal directly with racial issues are Malorie Blackman's Noughts & Crosses and Harper Lee's To Kill a Mockingbird and I've loved them both, so I guess that's proof that I should read more books like this one. Lies We Tell Ourselves is difficult to read in the best kind of way. Does that make sense? The racism and abuse and outright cruelty that Sarah and her fellow black students, and the black population in general, face is sickening. It's awful to know that people were treated this way (and that, in some places, they still are) but stories like this one are so important. It's so important for us to remember the difficulties some people faced, and still face, purely because of the colour of their skin. I will never understand racism - I never want to understand racism - and I hope one day we'll see the day when colour no longer matters. If any of you think racism is a thing of the past, I implore you to open your eyes. I really enjoyed Robin Talley's writing, particularly the sections in which Sarah thought about her relationship with God and whether or not God meant to make her feel the way she feels, whether the Bible says there's anything wrong with women loving other women, were so touching and beautifully written. To be honest I fell completely in love with Sarah - she's a wonderful heroine, and I just want to give her a hug. There were a few little niggles that meant I couldn't give the novel five stars. For me the ending seemed to wrap up very quickly; I was hoping for more of a climax, more of a 'BANG!'. Instead we were told a lot which was then never realised: for example, I was hoping for more of a confrontation between Linda and her awful father. I didn't want to see her getting hurt, but she seemed to get away from him very easily considering how hopeless she'd made her situation out to be, though I suppose a lot of Linda's issues were more insular than anything else. I could also totally understand why Linda had feelings for Sarah, my little cherub, but I couldn't always understand why Sarah had feelings for Linda. I appreciated the idea that Sarah could argue with her and feel more like herself, and I really appreciated that Talley didn't write Linda as a super special snowflake who had none of her father's beliefs; she's had her father's views imposed on her all her life and people don't change their beliefs overnight. But she is racist. There's no denying that. Linda is racist and her racism gets people hurt. She does change her views - which is also an important message, because everyone makes mistakes and everyone deserves the opportunity to be given the time to develop and change their views; I said some stupid things when I was 18, too - but she is a racist when Sarah develops feelings for her, and though it wasn't entirely unbelievable I sometimes had a difficult time understanding why Sarah found her attractive in more than just a physical way when some of the things that came pouring out of her mouth were so ignorant and hurtful. Ultimately, however, this is a brilliant debut novel and I thoroughly enjoyed it. I flew through it and I'm really looking forward to reading more of Talley's work! I loved this book, and I agree with so much of what you say. Great review! I didn't realize Robin Talley has a new book coming out -- have to go look it up immediately!